this ARO Jodhpur Army Bharti will starts from 06-04-2019 to 20-05-2019. ARO Jodhpur Army Bharti rally will be held from 01-07-2019 to 10-07-2019. Candidates selection is based on Physical Tests, Documents verification, Medical Test and written exam. Admit Card for this ARO Jodhpur Army Bharti Rally will be available from 15-06-2019. Official website to apply online and download admit card is www.joinindianarmy.nic.in. 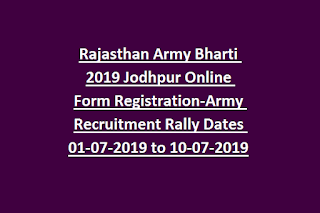 We are providing age limits, physical tests details, rally location, army rally dates, qualifications, and other details are updated below for this ARO Jodhpur Army Bharti 2019 is updated below. For Soldier GD Posts candidates must have born in between 01-10-1998 to 01-04-2002. For all other Soldier posts age limits dates are 01-10-1996 to 01-04-2002. For all the posts Weight is 50 kgs. For Soldier Clerk/Storekeeper/Inventory Management-Height is 162 cms and Chest is 77+5 cms. For all other posts Height is 170 cms and chest is 77+5 cms. 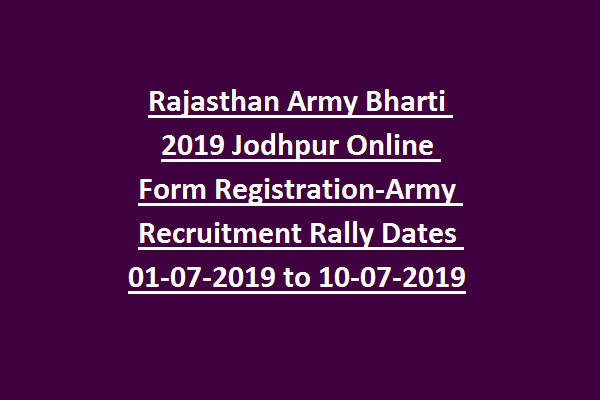 Apply online on or before for this ARO jodhpur Recruitment Rally 20-05-2019. Official website to apply online is www.joinindianarmy.nic.in. Admit Card for this ARO Jodhpur will be available 15 days before the exam date.